On tonight’s GAME OF THRONES the show was another great one. Tyrion was still in jail, but Jamie believes he did not kill Joffrey. It was also revealed who was behind Joffrey’s murder. I cannot wait till next week’s episode. Next week’s episode is called, “First of His Name” and we have managed to get our hands on some juicy spoilers and a sneak peek video of next week’s episode. On tonight’s show Dany balanced justice and mercy and over took the city of Meereen. Jaime tasked Brienne (Gwendoline Christie) with his honor. He requested that Brienne find Sansa. Jon secured volunteers to go with him to Craster’s Keep to avenge Lord Mormont’s death. Bran, Jojen (Thomas Brodie-Sangster), Meera (Ellie Kendrick) and Hodor (Kristian Nairn) stumbled on shelter. More happened, did you watch tonight’s show? We did and we recapped it for you HERE! On next week’s show Jon starts a new mission – he heads to Craster’s Keep. 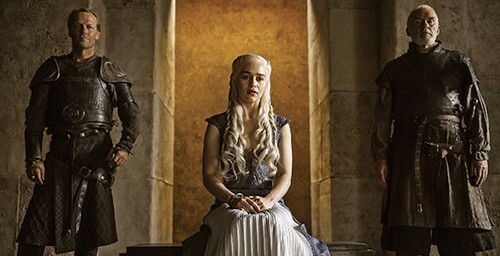 Cersei and Tywin consider the next move for the Crown. They get Joffrey’s younger brother Tommen crowned King, hence the name of the episode “First of His Name.” Because Tommen is so young that will leave Cersei and Tywin able to pull the strings of the Kingdom. But, the duo better watch Joffrey’s widow, Margaery who also has designs on Tommen. Daenerys makes plans for the future. She tries to decide if she has enough men to take Kings Landing. The episode was written by “Game of Thrones” series creators David Benioff and D.B. Weiss. What did you think of tonight’s episode? Are you enjoying this new season as much as I am? Hit the comments and let us know your thoughts! The Game Of Thrones Season 4, Episode 5 “First of His Name” airs on HBO on April 27th, 2014. Check out the preview videos from episode 5 below and let us know in the comments below what you think!